Every year numerous people travel to this land of reasonable shopping, tasty treats, and fascinating destinations. Some are here as backpackers, while others are here with their families. You may have heard from many of your fellow friends about the treasures they looted from floating markets, and other Thai shopping centres. However, apart from fancy dresses and footwear, there is so much more to Thai shopping , so be sure to have a large room in your bags before making your way to Thailand. Here are our top suggestions that are a must buy when you visit â&#x20AC;&#x153;The Land of Smilesâ&#x20AC;?. 1. NaRaYa Bag Favourite local brand NaRaYa offers high-end fabric handmade bags and pouches. These bags come in all kinds of colours and designs and have a flagship pattern of a big ribbon attached in the middle. 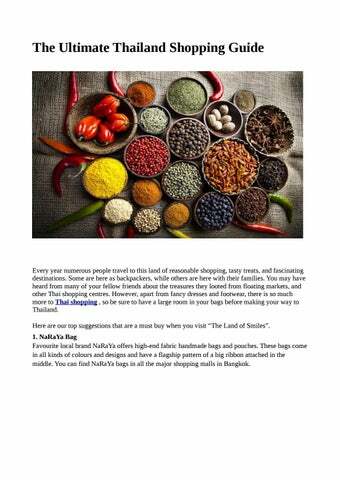 You can find NaRaYa bags in all the major shopping malls in Bangkok. 2. Fruit Soaps Treat your eyes to the wide range of beautiful fruit soaps, each of which boasts an elegant shape and is crafted intricately. These are so lovely, you will find it difficult to wash your hands with them. Many tourists prefer to enjoy the fragrances rather and display these ornaments for decorative purposes. 3. Thai Umbrellas Many Thai places like Chiang Mai are home to various brands that produce and sell umbrellas. These are crafted from renewable bamboo, which is also environmental friendly. The umbrellas are made using lovely traditional and modern materials and their canopy is made of highly waterresistant oiled cotton. 4. Thai Silk Thailand is quite popular for its beautiful fabrics and silks. These fabrics come in colourful and bright designs and are highly recommended as souvenirs. 5. Thai Spices Thailand is a haven for foodies, but how does it feel when it’s time to go home and leave all the delicious snacks behind. Don’t you feel like packing everything into your bag and take them back with you? Well, it’s now possible; all the spices and flavours of these snacks you love can be taken home, as you will find them in a variety of shops as gift items. 6. 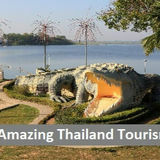 Thai Ceramic Souvenirs From majestic white elephants & elegant Bencharong crockeries to long-tailed boats & colourful tuk-tuks, Thailand is well known for ceramics. These enchanting statuettes are lovely and wonderfully detailed and make for unique gift souvenirs. Bencharong is the “Royal pottery of Thailand” These teacups and crockery are used by the kings and royal families or royal guests for meals. 7. OTOP One Tambon One Product chooses one superior product from each tambon and brand it as starred OTOP product. These products are also promoted on local and international stage. OTOP products cover a wide range of local products including cotton and silk garments, handicrafts, fashion accessories, pottery, household items, and foods. 8. Thai Gems Thailand is home to many of the world’s finest coloured gemstones. Almost all kinds of gemstones from around the world are brought here to be processed. However, while shopping for gems, ensure that you get a certificate and guarantee of the product. 10. Artificial Flowers Perfect for home decoration, Thai artificial flowers come in a variety of innovations and designs. The different types of flowers available include hydrangeas, lilies, sunflowers, amaryllis, magnolias, peonies, roses, and much more. 11. Thai Snacks Whether you are a snack lover or feel too lazy to cook, Thai snacks are perfect for you. Some of the popular Thai snacks are Bento Squid, Tao Kae Noi Seaweed, Bangkok Mini Cookies, Chicken Floss Rice Crackers, Durian chips, Crispy Pork Sticks, MAMA instant noodles, etc.